A thin julienne or a thick shred. However you classify the cut this device does, it can come in pretty handy. Use it for vegetable salads, garnishes, side dishes and more. You will find it is easier than ever to slice and shred vegetables, and you will achieve perfect, uniform results each and every time. Use this great gadget for shredding carrots, potatoes, onions, apples, or cucumbers. It is even great for cheese. It produces a slightly thicker and more stick-like shed when compared to traditional graters and shredders. It is actually doing a thin julienne cut. It is not quite a shredder, and not quite a slicer. One thing is for sure though. No kitchen is complete without one of these great tools. Cut like a professional, and do it faster and more safely than ever. The Borner Thin Julienne Slicer allows you to slice carrots, potatoes, onions, cheese, the possibilities are endless! It does not matter how hard or soft the food is, the super sharp blades will slice through anything. If you tried to do the same type of cutting by hand, it would take at least twice as long and you wouldn't get the perfect looking results that this device delivers. The Borner Thin Julienne Slicer is a handy and durable way to quickly and uniformly chop all of your favorite vegetables into long, uniform strips. The cut offered by this tool would be considered to be a bit thinner than your average julienne. This can be a great advantage for certain types of food prep, but many people may prefer the thicker, more standard vegetable sticks. If you would like to quickly julienne vegetables, but you want the sticks to be thicker and wider, check out the Borner V Slicer. It comes complete with blade insers to cut two thicknesses of sticks, and you can even get additional blades to do two more. The sizes offered by V-Slicer would be considered more standard, but it is just as easy to use. For more of a thick shred, or slender strip, the slicer on this page would be ideal. This great kitchen gadget from Borner makes it easier than ever to have professional, uniform results when cutting food. Incredibly sharp blades and superior construction make this cutter extremely efficient and easy-to-use. Just slide your vegetables across the surface for a quick and precise cut. If you like shredded veggies, then this is the right tool for you. Achieve perfect, uniform results every time. Quickly create perfect, thin strips of food. The double rows of German-made stainless steel blades are super sharp, and allow you to cut in both directions. 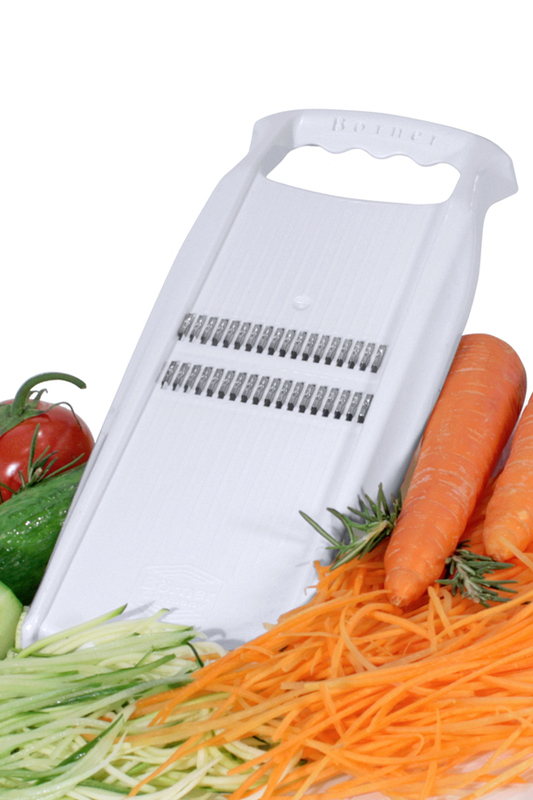 Get better results in half the time with this useful vegetable shredder and julienne slicer. For your safety, you should always use this tool with the safety food holder, which is sold separately, or as a money saving combo above. With the additiona of the holder, you will be able to increase speed, protect fingers, and slice more food without waste. High quality materials and superior manufacturing ensure it will last for years of reliable use. The unit features convenient finger grips and non-skid feet. Dishwasher safe. Borner of Germany manufactures some of the finest quality vegetable slicers on the market today and are leading edge in design and technology. Their unique products help add creativity to any gourmet meal. A tool maker by profession, Mr. Borner developed a method to manufacture razor sharp thin blades and to bend the blade in such a way that it makes cutting and slicing fruits and vegetables easy work. Borner products help add creativity to any gourmet meal. All Borner products are made in Germany. Order Yours Today! Works great. Potatoes come out a little too thin though. LOVE,LOVE,LOVE my Thin Julienne Slicer best thing ever. I love it. Exactly what I needed. Easy to use. Thanks. Easy to use, cleanup super smooth. Kitchen must have. Borner did it again! Fantastically easy to use, and the results are marvelous. If you like super-fine julienne cuts get one of these. You've given me just what I needed. Can this item be bought at Walmarts? I specifically bout this for carrots. I also bought the hand protector gizmo. When you use the gizmo with carrots you have to use large carrots and when the carrot gets down to the last bit, it won't slice the last small portion of the carrot so there is some waste. Not too happy about the hand protector food holder. just what i was looking for, excellent slicer, quick delivery and best service. I really like this thin julienne slicer and have used it often since receivint it. I have lots of different Julienne slicers. But this Borner thin Julienne slicer, is the best, its very good to use and a wonderful gift ! I use this Julienne slicer for making Sweet Potato Hay and works great for that. Comes out in very thin long strings using a longer sweet potato. Great price on it here too! This makes quick work of potatoes for hash browns! The hand guard works great. Just what I needed to make carrot salad. The julienne strips are perfectly thin and of uniform size (unlike my results with the knife). I love it. Have also used to julienne zucchinis and cucumbers and am very pleased. I'm looking for a tool to slice zucchini about 1/8" to make zucchini lasagna. Will this work? Yes it will. It's pretty much the perfect tool for the job in this case. I ate at a Black Walnut restaurant in the woodlads, TX and they had very thin julienned apples added to their salad. I wonder if this will julienne apples? Oh yeah. It will definitely work with apples. I am looking for a slicer for meats and cheese, do you have a julienne slicer for this type of operation? This slicer, or the Borner mandoline slicers will work with meats and cheeses.